Last weekend I attended WordCamp Denver, the “conference created for enthusiasts, users, developers, designers, and fans of WordPress“. It was basically a time to geek out with fellow programmers, developers, and bloggers. 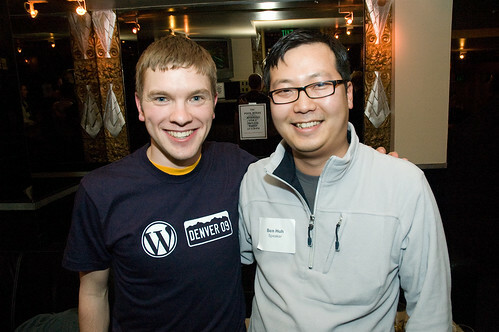 For me, the highlights were Matt Mullenweg’s State of the WordPress, Ben Huh’s I Can Has WordPress, and learning about the Carrington Theme Framework. I also got to meet (and have a quick photo op) with Matt, Ben, and Lorelle VanFossen. Matt even took a picture of me…well, my t-shirt at least. It was also great to finally meet Alex King and most of the rest of his crew (Devin, Shawn, Sean, Gordon, and Jeremy) at Crowd Favorite. They did a great job organizing the event and without them this would have never gotten off the ground. I also think that if I ever got tired of engineering and wanted to do web development full time, Alex/Crowd Favorite would be the first person I’d talk to. Interesting side note: Alex grew up in Seattle just around the block from me. Small world, eh? 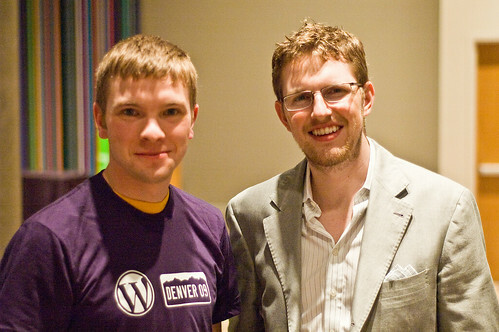 By the way, I think Matt Mullenweg is infinity better/cooler/more awesome than Mark Zuckerberg. And I feel safe in saying that without actually having met Mark. Two words: Open. Source. Who: Local bloggers, web developers, publishers, designers, internet and marketing enthusiasts, companies interested in blogging and/or building on WordPress. Yes, I’m super nerdy. Deal with it.